Big Tops Days, Circus Skills Workshops and Circus Entertainment for Schools and Events in Manchester. Circus Sensible have been running Circus Skills Workshop Days and Big Top Days for Schools and Events in Manchester & Nationwide for over 25 years. For Festivals, Fairs, School Fundraisers, Transition Days, Corporate events, Guide camps etc. Just have a look at our feedback to see how well our Circus days go down. Shows in the Big Top, Circus Workshops and Lots More. For School and Events, Arts Weeks, Fun Days, Fundraisers, Guide and Scout Camps, Parties. Manchester & Nationwide. A Day with one of our 'baby' Big Tops includes two or three Shows in the tent for up to 250 children and adults, and an ongoing Circus Skills workshop. Our Big Tops need level, well drained grass with no underground pipes or cables and with access for our van right up to the site. We need about two hours to set up and an hour to take down. Structured Circus Skills Workshops or Drop-in Workshops for Schools, Festivals and Fairs in and around Manchester & Nationwide. We will travel!. Skills covered include Juggling, Plate Spinning, Diabolo, Poi, Devilstick, Stilts, Hula Hoop, Tightrope and Unicycle, plus lots more. 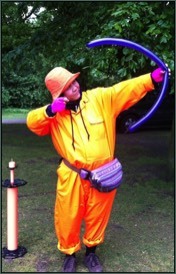 More informal 'Drop-In' Circus Skills workshops go well at Festivals, Parties and School Fun Days. All we need is some grass or a hall where we can put out the equipment. We then invite everyone to have a go while we go round TEACHING, ENCOURAGING and ENTERTAINING!. Other workshops also available. See our Reviews. Circus Workshops in Schools are a great way to engage the children, teaching them skills which can benefit them in the rest of their school life. The day usually starts with a Show/Demonstration, followed by Circus Workshops, class by class. Week long residences also available. We cover manchester and the whole of the UK. Hire one of our Beautiful, blue and yellow BIG TOPS without those strange Circus people! For your School, Festival, Wedding or Event. See what people have said about us. Circus skills workshops in Schools, Balloon Modellers, Face Painters, Stiltwalkers, Jugglers, Unicyclists, Close up Magicians, Music and Percussion and Dance Workshops. Recent Clients include CBBC, Hampton Court Palace, Apple, Amazon.co.uk, JD Williams, Festival Republic, Wales Institute for Sport, Out of the Office, Manchester Airport, Gayles Honey, Oxford University, Durham University, Aberdeen University, UCLAN, Haygarth, Rewind Scotland, Rewind North, Tour of Britain, Tour de France, Just So Festival, Barclays Bank, Lancaster University, BBC Good Food Festival plus HUNDREDS of Primary and Secondary Schools and Events. 'Wow! Brilliant! Fantastic! The joy and smiles generated on the day was beyond what I expected, the visual effect of the Baby Big Top was incredible. We had 450 people attend our district camp, the team did an amazing SHOW and kept the youngest (6 years old) to the oldest (79 years young) entertained throughout. I would have no hesitation in recommending you to others and we look forward to using you again in the future.' - Dale Harrison, District Scout Camp at Kibblestone Scout Camp, Staffordshire with our Big Top Day. 'Last week our 3 reception classes were visited by Obby! Recent Scientific research has shown the value of Circus and other physical skills in an educational environment. It has been recognised that the core skills which are utilised and developed when we learn and practice a challenging and creative activity such as Circus skills, can then be carried over into the more academic areas of education. Activities such as Circus skills have been used with great success as an educational tool, as an aid to learning as well as therapeutically with children at risk and with children with special needs. Circus skills workshops in schools are an opportunity for children and adults to discover and develop skills such as Concentration, Information retention, Concept visualisation, hand eye co-ordination and self awareness. These skills can then be used in many other settings including social situations and in conventional educational settings whilst learning the core subjects. Why book Circus Sensible for your event? Book us with one of our Beautiful Circus Tents and that alone will make your event into something much more special. If we take our Big Top into your School for a day of shows and circus skills workshops, just watch the children’s faces as they see the tent on the school field as they arrive. Have a look at our web pages and videos to get an idea of the difference we make. 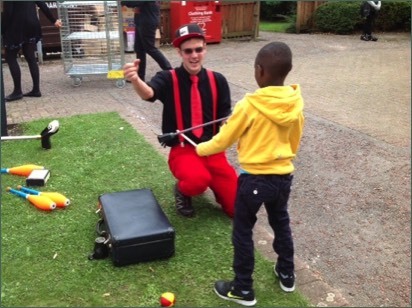 Also, circus skills offer a huge range of benefits to children and adults of all ages and abilities. Perhaps the greatest benefit of having a go at Circus skills is that almost anyone can achieve so much in such a short time, giving the participant a great sense of achievement and immediate positive feedback from those around them. This leads to a more positive self image and an increase in self confidence in many children. Many of our circus workshops in schools also include time for the participants to demonstrate the circus skills they have been learning. 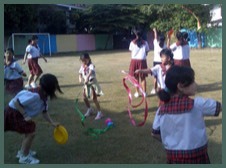 Circus skills also help develop and improve concentration skills. This is particularly evident in those children with shorter attention spans. When we run Circus workshops in schools the teachers are often amazed that one or more children who usually have a problem concentrating are doing better than anyone else in the class! Learning Circus skills also offers great benefits in terms of physical co-ordination and physical fitness. Circus workshops in schools fit very well into the school curriculum under PE and co-ordination development. In fact there are many areas where Circus workshops offer great opportunities for curriculum enrichment. Circus Skills workshops in Schools are suitable for Nursery, Primary, Secondary Schools and Colleges and can be integrated into many areas of the School curriculum. All our staff are very experienced and have CRB certificates. We have full Public Liability Insurance and can supply Risk Assessments on request. Circus Sensible also run many other workshops in schools, such as Percussion workshops, African Dance workshops and Magic workshops. Circus Sensible have been working at all sorts of venues all over the UK and abroad, for over 25 years. We have a huge amount of experience in working with many different groups of all ages and abilities. Below are a few examples of venues visited and services we provided last year. Rewind Festival, Perth, Scotland - Circus Skills workshops, Balloon modelling, Stiltwalkers, face painters and Shows in our 48 foot ‘baby’ Big Top. New Scene Centre, Chester, Cheshire - Circus Tent Hire, Circus skills workshops and Walkabout entertainment for Chester Cycle races. 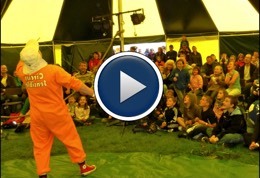 Coworth Flexlands School, Chobham, Surrey - Circus Shows and Circus skills workshops in our 48 foot Circus Tent. Hindley Childrens Centre, Wigan, Lancashire - Shows and Circus workshops in and around our 48 foot Circus Tent plus Stiltwalkers, Balloon modellers and Magic. Dovery Down Lower School, Leighton Buzzard, Bedfordshire - A Day with our ‘baby’ Big Top including Shows, Circus skills workshops and Balloons. Hurst Park, London - Walkabout Entertainment in the form of Stiltwalkers, Unicyclists, Magic and Balloons for the Stroke Association. Holy Trinity School, Gravesend, Kent - A day of Circus skills workshops in the school. Swindon Academy, Wiltshire - A day with our 48 foot Circus Tents including Circus shows, Circus skills workshops and more, for the whole school. 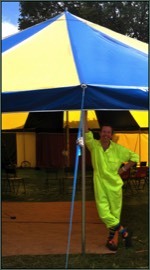 Burns Festival, Ayr, Scotland - Hire of our 30 foot ‘baby’ Big Top plus Circus skills workshops over three days. Border City Steam Fair, Carlisle, Cumbria - Shows, Circus skills workshops and walkabout entertainment with our Circus Tents over three days. Bristol Hotel, Bristol, Avon - Circus Workshops and Entertainment for the Apple UK Staff party. Holy Family School, Slough, Berkshire - A Day with our Circus tent, Shows and Circus skills workshops. Those are just a few examples of venues and events from last year. For more examples of venues from the last 12 months, see below. We have run Circus skills workshops in well over a thousand Schools over the years and days with our Big Tops at almost as many. Anson Cabin Project, Manchester - Drum and Dance workshops. St. Cuthberts RC Primary School, North Shields - Two days of Circus skills workshops. Ben Jonson Primary School, Stepney Green - A Day of Circus skills workshops..
Gatten & Lake Primary School, Isle of Wight - A Day of Circus skills workshops. Groundwork Oldham & Rochdale - Circus Workshops and Face painting. Raglan School, Bromley, Kent - Circus skills workshops. Fetcham Village Infants School - A Day with our Circus tents. Bengeo Primary School, Hertford - A Day with our ‘baby’ Big Top. The Big Picnic, Chorley - Circus Skills workshops and Balloon modelling. Parkwood Academy, Sheffield - Three days of Circus Workshops. Swindon Academy - A Day with our Big Top including shows and workshops. St. Peter’s Primary School, Bromyard - A Day of Circus workshops. Hurst Park, London - Stiltwalkers, Unicyclists, magicians. Weydon School, Farnham, Surrey - Two days of Circus skills workshops. Westminster School, Bradford - A Day of Circus workshops. Itchen North District Camp, Southampton - A day with our Circus tent. Middlewich Boat Festival - Circus skills workshops with our Big Top. Sacred Heart Primary, Ilkley - A Day of Circus skills. Tea in the Park, Morecambe - Circus workshops and walkabout. Liverpool Chester Bike ride, Chester - Circus entertainment with our Big Top. Milton Primary School, Mossley, Tameside - A Day of Circus skills workshops. Thistley Hough High School, Stoke, Staffordshire - Hire of our ‘baby’ Big Top. Thorpe Primary School, Peterborough - A Day with our Circus Tents. Sibford School, Banbury, Oxfordshire - A Day with our Circus tents. Holy Rosary School, Oldham, Lancashire - A Circus day with our Big Top. Norfolk Lodge Montessori School, Barnet, Hertfordshire - A Day of circus skills workshops. Heathrow Primary School - A Day with our ‘baby’ Big Top. Worthington Primary School, Leicester - A Day with our ‘baby’ Big Top. Lisburne School, Offerton, Stockport - A Day of Circus skills workshops. Cheethams Park, Stalybridge, Tameside - Circus skills workshops with our Circus tent. Hadlow Fields, Wirral - A week of Shows, workshops, fire show and more. Oldham Pride - Stiltwalkers, face painters, Balloon modellers and more. Dartford Festival - A Day of shows and workshops with our Big Top. St Thomas Primary, Huddersfield - A Day with our ‘baby’ Big Top. Rose Hill Primary School, Marple - A Day with our Circus tent. Burghley House, Stamford, Lincolnshire - Four days of Workshops and shows. Pendle Predator, Lancashire - Two days of Circus workshops with our Circus tent. Northmoor Neighbour's Day Street Party, Stockport - Circus skills workshops. The Hut, Hull, Yorkshire - Circus skills workshops. Forest of Galtres Festival, York, Yorkshire - Hire of our 48 foot Big Top. Whalley range Surestart - A Day of Circus skills workshops. 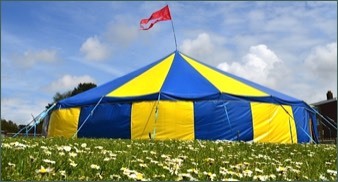 Ramsbottom Music festival, Lancashire - Hire of two of our Circus tents. Cottons Hotel, Knutsford - Wedding entertainment, Magic and balloons. 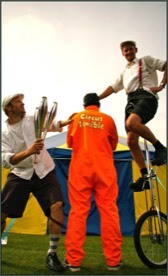 Cycle Event, Kirkcaldy, Fife - Circus workshops with our Big Top. Hyde festival Theatre, Hyde, Tameside - A week of Circus skills workshops. St. Bede’s School, Redhill - A Day of Circus workshops. Christ the Saviour School, Ealing - Circus skills workshops. Hyde Town Hall, Tameside - Balloon Modelling. Dedworth green School, Windsor - A Day of Circus skills workshops. St. Mary’s CE Primary School, Tunstall - Circus skills workshops. Adlington Primary School, Cheshire - A Day of Circus skills workshops. St. Stephen’s CE School, Shepherds Bush - Circus skills workshops. 1st Staines Scouts - Circus skills workshops for their Circus Badge. The Bristol Hotel, Bristol - Circus Entertainment for the Apple staff party! Janet Duke Primary, Basildon - A Day of Circus skills workshops. Broom Valley Community School, Rotherham - A Circus Day with our Big Top. Children’s Party, Skelmersdale - Circus Entertainment for Children’s party on ‘My Big Fat Gypsy Wedding’. Stalybridge Brownies and Guides, Tameside - Circus skills workshops. Well....all the staff and I from Horndean Infants is say WOW! Adults and children have had the most fun filled, perfect day with the A team (Kyle, Obby and Richie) today. At 6.30 am,when I met them at school, it was obviously early (for me) and pouring with rain..... But that did not stop the energy of all 3 of them from the word go! I did my bit, making them hot drinks as they pitched the tent in good spirits in the heavy rain - I knew from then that this was going to be a day to remember! At 9am the whole school, dressed as circus characters watched the hilarious show (piched perfectly for the age of the children) and this inspired the children's writing and art work for the rest of the day back in the classroom. The workshops throughout the daywere fast paced and enjoyable, building on children's resilience and personal and social skills.All we could have asked for was more! We then asked if we could have a second performance to close the day as the morning had been so amazing and again, there was no hesitation - the guys were so willing and genuinely wanted to make the day special for each and every child! We all left school with huge smiles today, all thanks to 'Circus Sensible'.... We cannot thank you enough and will definately be asking you back again in future years - if you will have us that is! We would all recommend you to other schools too. Dear Clive, I just wanted to say again that the kids had the most fantastic day and can't stop talking about the circus skills they learnt. The activities were catered for their age exactly and they were kept busy the whole time! Hello Clive, I just wanted to feedback to you following the workshop last week. We were really pleased with the workshop. Obby managed the young people really well. As you may be aware we are a fostering organisation so all of the young people in attendance are currently living with Foster Parents. They can be challenging at times and when together in a group this can heighten the behaviours they exhibit. Obby showed the young people how to use all the different equipment clearly and with humour. He spent time with those that struggled and encouraged them when necessary. He was able to sense when to move things along and made sure that everyone felt included, even staff! At the end of the day, young people had the opportunity to show Foster Parents what they had learnt which was lovely to see. I hope that we can offer this workshop again in the future. Our Circus Sensible day was wonderful. The children were totally engaged in all the activities. The staff had fun too, two of us learning to hoopla hoop at fifty plus! We have used the day to inspire storytelling based on a circus theme and many of the activities we did have been mentioned in the stories. It was a truly memorable day. Keep up the good work! Dear Clive, Just wanted to thank you for the great programme that Obby ran for us tonight. It was a great success – we had lots of good feedback from those attended. Obby was fantastic with both the kids and the adults – he inspired a sense of fun and humour which helped to make it an evening the community will remember for many years! Best wishes - Rabbi Alan Garber, Shenley United Jewish Community, Hertfordshire. Just wanted to let you know what a brilliant day we had with John Sensible on Tuesday. The children were fascinated from the moment they saw John. I just want to say a very big thankyou for the excellent day of circus skills that you provided for our year 3/4 children today. The organisation and timimg of the day was smooth and appropriate. The activities that you provided were enjoyed fully by all of the children (and teachers!). As one of their teachers, I recognised that you brought out confidence and motivation in all of the children and at all times you were in control of their behaviour and their learning. Your rapport with the children was lovely to watch. The children thoroughly enjoyed all of the activities including juggling, plate spinning and feather balancing. It was also great that they had the opportunity to have a go at other activities too. Hi Clive, thank you so much for yesterday. The children all had a fantastic time. It was lovely to see even the quietest of pupils become so animated and involved in your sessions. Also it was interesting to watch the 'cool' Year 6's drop their guards and throw themselves into the activities with such gusto! - Helen Courtney, Aldford Primary School, Chester. Hi Clive, many thanks for coming over to Kelsall. It really was an excellent evening inspiring both the young people (and the leaders) with a great range of stuff to do. We all really appreciated the way you introduced each activity and got the young people engaged in having a go at something new. I know it has resulted in an outbreak of juggling in a number of households round the village. Many thanks and hope to catch up with you again soon. - Daniel Gaskarth, Kelsall Youth Club, Chester, Cheshire. Hi Clive, I just wanted to say thank you for sending such inspiring tutors for the workshops at the school. We completed a pupil evaluation of the day and it was overwhelmingly positive - needless to say we will be booking you again next year. Thank you so much! - Tanwen Fisk Spalding High, Lincolnshire. Dear Clive, On behalf of the Variety At Work Committee, we would like to sincerely thank you for attending our Big Top party! Your contribution helped us to achieve so much and ensure the children and their carers who attended the party had a wonderful time. We are very grateful for your support and hope we work with you in the future. - Glenda Shiner, Chairman of Variety at Work. Just a quick email to say a huge thank-you for the fantastic day provided by Circus Sensible. Quite simply, in the two weeks of various agencies providing activities at our summer school, your company has provided the gold standard by which all other agencies that work in school should be judged! Thank you so very much for a wonderful day and evening at St Paul's Primary School in Hereford. The children had a truly wonderful day and have been buzzing about it ever since. Please do pass our sincere thanks to the rest of your team; it was a real pleasure to have you all here for the day. I hope we will be in touch in the future for another booking. Hello Clive,I wanted to send you a quick note to say thank you for the circus entertainment that you provided for us on Friday. Jane and Klas were absolutely fantastic and we had some great feedback from our residents about them. They really did go down really well at the event so please could you pass on my thanks to them both.I will be sure to keep your contact details on file in case we have a similar event in the future. A HUGE thank you to you all for the most amazing party yesterday. Everyone had a fabulous time & you all helped to make some very special memories thank you so much!!! Circus Sensible provided a FANTASTIC week long contribution to Girlguiding Wirral's Centenary Celebrations. Stilt walkers, interactive dance, drumming workshops, circus shows and skills, they provided workshops so the girls could be involved in the opening ceremony and they provided the most fantastic fire show for our closing. They provided the carnival atmosphere they promised. They surpassed our expectations and that of many of our leaders and girls and we could not recommend them highly enough. Can't wait to have another event we can use them for! THANKYOU PapaClive & Crew!!!!!!!!!!!! - Linda Smallthwaite, Wirral Girl Guides. 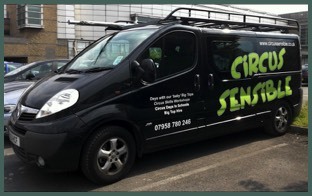 I have used circus sensible for a number of years at the Wirral Food and Drink Festival and each year they deliver a fantastic service. 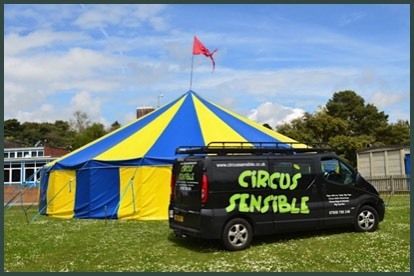 The tent and gear is new and always clean, they work tirelessly over our two day event to deliver entertaining shows and circus workshops to both children and adults. i would happily recommend them for any event wishing to offer great children's entertainment at affordable prices....looking forward to having them back in 2012 with 2 tents,performances,workshops,a stilt walker, balloon modeller and face painter...need i say more??? - Andrew Pimbley, Wirral Food Festival. Circus Sensible ran a day of circus skills workshops at our Primary school.Clive was wonderful and engaged the children in all key stages. The children really enjoyed the day and gained a lot from their activities, remaining focussed and on task whilst having fun. 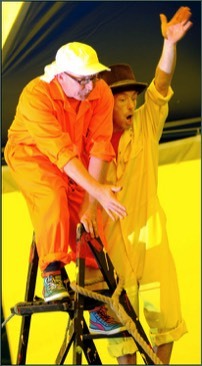 We would recommend 'Circus Sensible' to anyone thinking of a curriculum enrichment day. - Milton St. John's School, Tameside. The show was fantastic and very funny. It is so nice to see a show that the adults can enjoy too! A Day with Circus Sensible can be anything from a day of Circus Skills workshops up to Shows, circus skills workshops and Circus shows in one of our Beautiful 'baby' Big Tops. Circus skills include Juggling, Stiltwalking, Plate spinning etc. 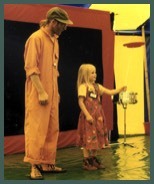 Shows in our Circus tents can last up to an hour and involve lots of audience participation. Entertaining for all ages. 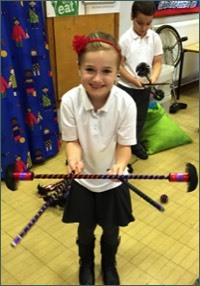 For Circus skills in schools, please see our Circus in schools pages. Our Circus tents are also available for hire, and we can provide Walkabout entertainment in the form of Stiltwalkers, Balloon Modellers, Unicyclists and Jugglers. There's even more though! What about adding on Facepainting, Henna Tattoo, or a pupptet show, a close up magician. If it's not listed here, we can still probably organise it! So, although we specialise in the Circus skills and workshops side of things, anything is possible!